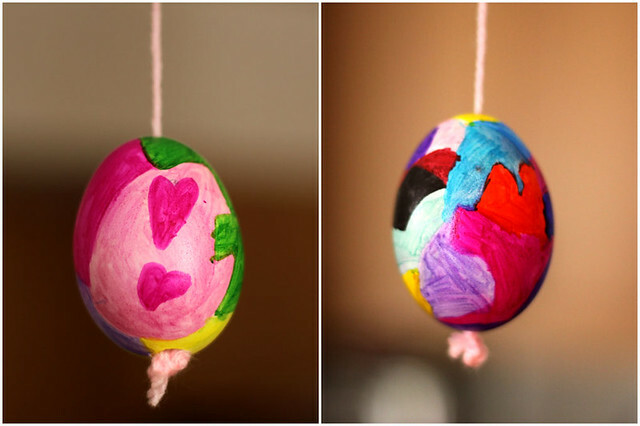 And then I do the dishes: Decorating Eggs - A fun Easter craft! We've been a crafty little bunch around here lately. I have a five (almost 6!) year old, who thinks a day without a craft is a day wasted. So I've been trying to be a creative mommy and find new ideas for us to have fun with. 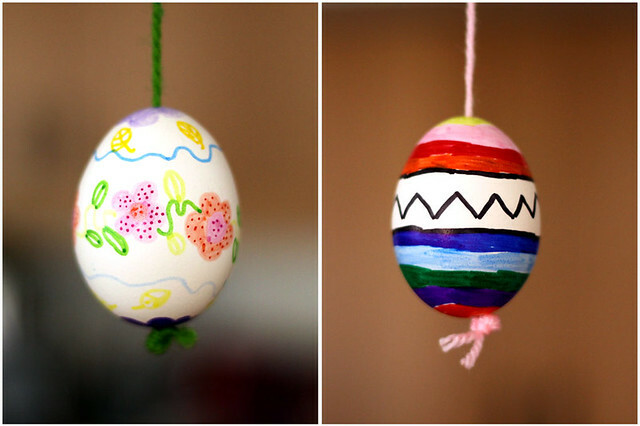 Since Easter is upon us, I thought it would be a good time to introduce my kiddos to egg decorating. First off, I needed to empty a few eggs. I'm not sure the permanent marker technique would work for hard boiled eggs as the markers aren't food safe. And I wanted our eggs to last a little while so I went the empty shell route. 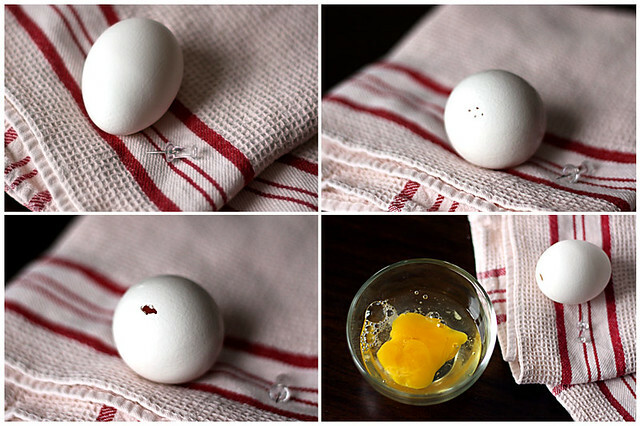 Here's what you do: use a thumbtack to make holes at each end of the egg, then use the pin to pry the little piece of eggshell off the egg. The holes don't need to be perfect and round. 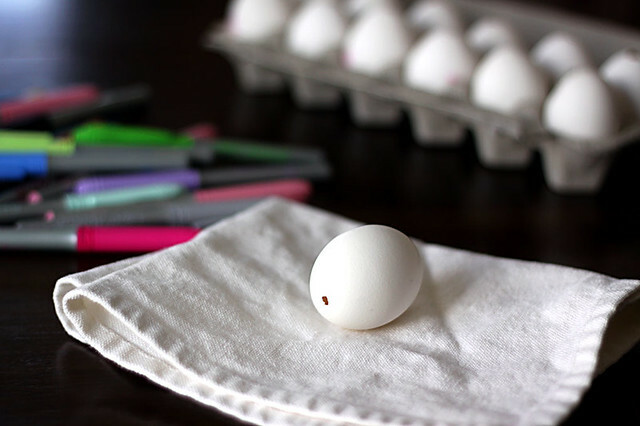 Once the holes are made, place a bowl under the egg and blow into one end. If your holes are big enough you shouldn't have any trouble getting the egg out of its shell. Then place the empty shell in some warm, soapy water (I used dish soap) and use a syringe to fill the shells with water. Shake it around a bit and let the egg shells soak for a few minutes. Then blow the water out, rinse the shells and place them on a clean towel to dry completely. Once they're dry, you're ready to decorate! Now, I have 2 girls and a boy, and we all know Easter rhymes with Spring and pastel colors and cutesy, girly stuff. I wasn't about to tell my 9 year old son he had to draw flowers and hearts and pink bows on his eggs, but I never expected him to make a zombie egg! Or an alien spaceship Easter egg, but, boys will be boys and I love that he has enough imagination to think of that stuff. See what I mean? 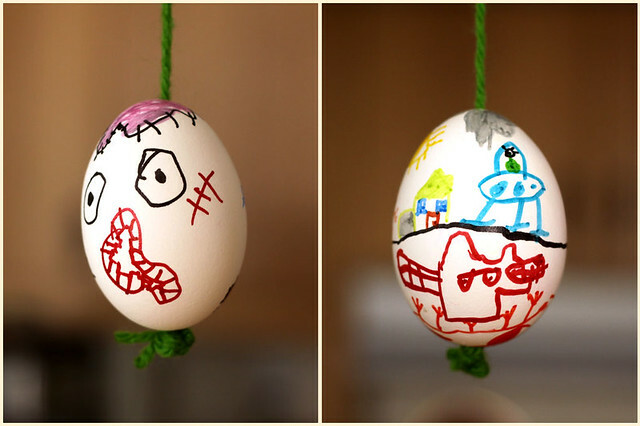 A 9 year old boy's idea of Easter eggs! 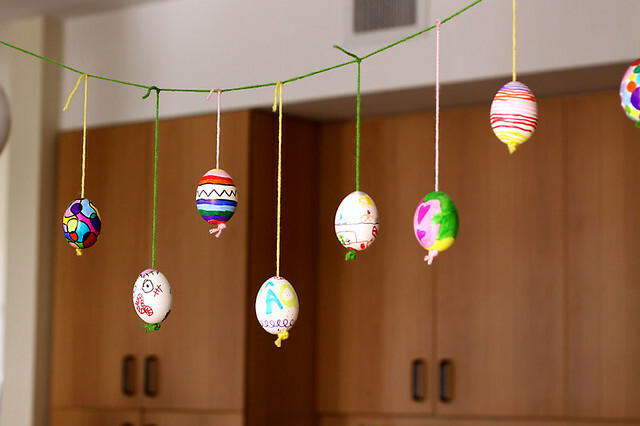 We had a blast decorating all our eggs and when we were done I made a simple garland out of yarn and hung the eggs onto it. It makes a really cute decoration for the kitchen. I like it so much I think it'll be there way past Easter. I might not wait until next Easter to do this again. I'm thinking Birthday Eggs, Halloween Eggs, Christmas... The possibilities are endless! As to what you can do with the eggs, the possibilities are endless here too. I usually make french toast, a frittata, a quiche or just simply scrambled eggs. We are big fans of breakfast for dinner so I never have any trouble with using up some eggs. 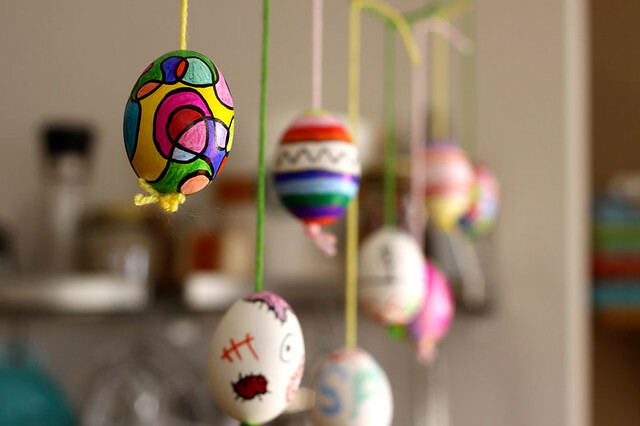 So go on, grab a few eggs and get your craft on! Happy Easter!!! Looks like fun! Kids would have a blast making these! My mom used to decorate empty egg shells and fill them with homemade peanut praliné. Oh, I miss those days!